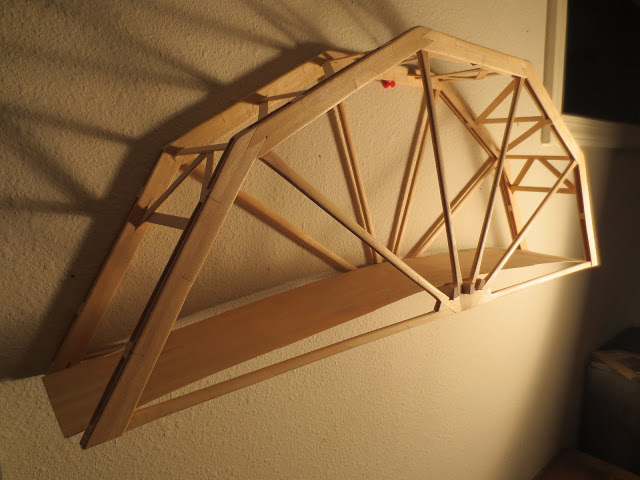 This album highlights the Popsicle Stick Bridge that I entered into the Seattle ASCE Younger Member Forum’s Popsicle Stick Bridge Competition in 2009. This particular entry swept all first place prizes in every category: efficiency, aesthetics, and poster. It’s 30 inches long, 11 inches tall, 5 inches wide, weighs just under 347 grams (0.77 pounds), is made out of only white birch Popsicle Sticks and Elmer’s White Glue, and it held 993 pounds before breaking (1300 times its own weight). When you think about it, it was really the wood at the bottom holding it. Not the truss. So really it didn’t hold that much. I would recommend to use a thinner base. It basically means that the base held 993 lbs. How many popsicle sticks did you use to make this awesome creation? How do you make this?! I mean it’s awesome but can you tell me the steps and supplies to make this? Hey! I was wondering whether the weights were directly under the bridge in the middle (hanging down) or if they were on top of the bridge? Hi, that is a really nice bridge, could you answer one question for me though? What process did you go through to “double” the sticks to make the frame? 48 queries in 0.419 seconds.